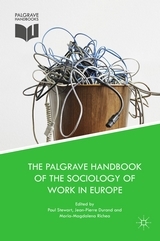 This book explores the key conceptual features of the development of the Sociology of Work (SoW) in Europe since 1945, using eleven country case studies. An original contribution to our understanding of the trajectory of the SoW, the chapters map the current state of the theoretical background of the sub-dlscipline’s development to broader socio­political and economic changes, traced across a heterogeneous set of national contexts. Different definitions of the SoW in each country often reflect variations in the focus of analysis, and these chapters link the subject definition and focus to other social science disciplines, the state, as well as social class interests and ideologies. The book contends that the ways in which the sub-discipline makes sense of changes in work is itself a response to the type of society in which the sub-discipline is practiced, whether in the post-war social democratic West, the Soviet East, or today’s societies, dominated by variant forms of neo-liberalism. It will be of use to scholars and students interested in the transnational history of the discipline of sociology, with a specific focus on the nexus between the sociology of labour, ideology, economics and politics. Paul Stewart is Senior Research Professor at Grenoble School of Management, France, and formerly Professor of Sociology, University of Strathclyde, UK where he was coordinator of the Marie Curie ITN ‘Changing Employment’ Programme. Jean-Pierre Durand is Professor of Sociology, University d’Évry Paris-Saclay, France, and Editor­founder of La Nouvelle Revue du Travail. Maria-Magdalena Richea is Marie Curie ITN Alumna, ‘ChangingEmployment’ Post-Doctoral Experienced Researcher, University of Strathclyde, UK.